Please scroll down within this tan box to reach the end of the questionnaire and contract. At the end of the contract, you will see a “submit” box—please hit that button. If you are having difficulty completing it on this website, you can go directly to the form here. Your spot is not considered reserved until you have completed these questions and contract on the website. Please click here to download to view and download PDF of the contract for your records. You will need a day bag/knapsack for overnight purposes: We have one chartered flight between Isabela island and San Cristobal island. On this flight, we are only allowed 10 kg of baggage per person TOTAL (including carry-on). This is a strict weight limit and not something that we can get around (not would we want to, safety-wise). We will ship the rest of our luggage on a ferry boat going from Isabela to Santa Cruz, then from Santa Cruz to San Cristobal. Depending on the day’s schedule, your luggage will arrive in San Cristobal later that night or possibly the NEXT day, so we will ask you to pack an overnight bag to bring on the plane with you for your first night/morning on San Cristobal. Your flight from mainland Ecuador to the islands includes 23 kg (50 lbs) of luggage. Snorkel gear will be provided on all of our excursions, but if you choose to bring our own for a perfect, comfortable fit, you are more than welcome. BJ is a HUGE fan of the full-face snorkel mask, such as those found here. Lauren is more of am old school purest with the traditional masks and likes the option of taking off and readjusting the mask if need be. However, even she has to admit the unimpeded view with the full-face mask is pretty impressive. Wetsuits (full or half) are available for rent pretty cheaply, should you choose to go that route. We do NOT think it is necessary to bring your own unless you feel moved to do so. When we visited in November 2015, Lauren did not use a wetsuit at all and BJ only used one once or twice (and his mortal enemy is cold water). Note: Depending on how long you are staying in Quito before or after the trip, please do bring enough warm-weather attire for your stay there, particularly chilly mornings and nights. Swim shirt. Waterproof sunscreens have a ton of chemicals dangerous to you and to the wildlife, so we try to minimize the need. We love swim shirts, especially long sleeve ones! This minimizes the risk of sunburn when we are on our swimming and boating excursions. Here are some examples on Amazon. We also like using Zappos.com, so you can try on and return your choices without any return postage fees. Light windbreaker jacket/rain shell for our boat rides (and possible splashes) or the occasional shower. You will definitely want this! 4-5 shirts or blouses. A lightweight long sleeve shirt is very nice for sun protection for our land excursions. Comfortable walking shoes for our land excursions or for the land-based part of our boat excursions. Sports sandals such as Tevas, Chacos, or Keens (Lauren’s current obsession) work great. You may wish to bring a small dry bag for our boat excursions, to keep your camera, towel, cover-up, etc completely dry. Good sunscreen is critical. For our non-water excursions, Lauren prefers mineral-based sunscreens: good for you, good for the environment. How do you know if it’s mineral based? If the active ingredient is either titanium dioxide or zinc oxide—that’s it. MyChelle and Devita make good ones. For our swimming/snorkeling days, please choose a water-based sunscreen that you like, or simply re-apply the mineral-based ones more often. If you need a recommendation on a camera, BJ would be happy to help, depending on what type of photography you like, how much you want to spend, and how much you want to carry around. BJ and Lauren are a big fan of the Panasonic Lumix FZ1000 for zoom wildlife photos, but you know that BJ can give recommendations for ANY camera needs! A waterproof camera may be a fun investment for this trip. Although we will be using a GoPro underwater and sharing the pictures, you may wish to capture your own memories! If you DO bring a waterproof camera or GoPro, it’s a good idea to have a floating wrist strap to avoid any accidental offerings to the ocean floor. If you do bring your camera, don’t forget extra batteries or your charging cord. You may want to think about an extra memory card, too. Toiletries (including preferred shampoo and conditioner, if required–with so much exposure to sun and saltwater, your hair might need extra conditioning). Any necessary feminine hygiene products. Plug adaptor for electronics for those of you coming from outside the U.S. Here’s a nice example of a great universal adapter and here’s one with USB ports, as well. This is the type of electrical outlet used in Ecuador. A small travel umbrella. It can work for rain OR as a parasol. Anti-nausea remedies for boat rides (could be simple Sea Bands, ginger candies or pills, or the equivalent of Dramamine, although remember that most anti-motion sickness pills, including Dramamine, can make you drowsy). Electricity is consistent throughout the Galapagos, and wifi is often present although very slow. Nevertheless, we encourage you to bring your smartphone or tablet, and please don’t forget your chargers! We recommend setting up Skype, FaceTime, WhatsApp, or another wifi-based calling service before leaving home, and familiarizing your loved ones with it before you leave. We require that our guests carry travel insurance because it just makes sense. It’s a relatively small expense but affords huge peace of mind for very little cost. When choosing a travel insurance policy we require that you are covered for emergency medical evacuation/repatriation. We also recommend you take out trip cancellation insurance, as this may cover cancellation penalties in certain circumstances if you have to cancel your trip unexpectedly due to illness, injury or unforeseen circumstances. We like World Nomads, but ultimately you have to choose the one that is right for you. If you’re 70 years old or older, you’ll have to use a different company (we can advise you if you like). We’ll be asking for confirmation of your travel insurance before your departure. Which countries or regions are you travelling to? What’s your country of permanent residence? What do I need to know about the visa? First and foremost, your passport MUST be valid at least 6 months beyond the end date of the trip (that is, April 6, 2018), and you’ll need two empty pages in the Visas section of your passport (make sure they are in the Visa section, not the Amendment or Endorsement section). Ecuador offers 90 day visa-free visits to citizens of most countries, including the U.S, Singapore, Australia, and Canada. I have special dietary needs—can I be accommodated? Seafood is obviously a big deal in the Galapagos! Omnivores and pescatarians will thrive. Vegetarians will find vegetable-based options, although the selection is somewhat limited. Vegans might find it more difficult, as the vegetarian options will often include cheese as a base ingredient. Email us and let’s talk about your veg preferences of you are concerned. Gluten-free guests should not have trouble, although we request you print this card out to carry with you for clarification. Please contact us directly for other dietary concerns. Usually all meals are included on your trips–why is this different? Included are your breakfasts and two dinners in the Galapagos. (In addition, light lunches will be provided on the days we have boat tours.) We’ve decided to give you more freedom in your lunches and dinners in the Galapagos due to the wide range of options there. On all three islands there are more value-oriented meal options (between $6-15) and more high-end options ($20+). We know that some of you might just want to have fresh lobsters at every chance, and some of you may be more content with simple Ecuadorian dishes. In a word, No. Although many cities around the world are getting more advanced public water systems, we don’t recommend it. Not only from a pathogen standpoint, but it’s a different set of bacteria than your body is used to. Why risk an upset stomach if you don’t have to? We recommend drinking only bottled water, and you will want to rinse your toothbrush off in bottled water. None are required to enter Ecuador, but we suggest you work with your physician or your area’s travel health expert to decide what options are best for you. You can read the American CDC’s Ecuador recommendations and the Scottish NHS recommendations by clicking here and here. What about malaria? What about Zika? Malaria is not a risk on our itinerary (Quito & Galapagos). As always, we request that you work with your physician or travel doctor when making these choices. Please see our blog about this topic for more information about malaria. This is what the U.S. Center for Disease Control is currently advising about Zika in Ecuador. *All of the information here is for reference purposes only and is not intended to substitute for advice from your licensed health care professional. These statements have not been evaluated by the FDA and are not intended to diagnose, treat, cure or prevent any health condition or disease. If you are experiencing medical issues, you should contact your medical health care provider. We require that our guests carry travel insurance because it just makes sense. It’s a relatively small expense but affords huge peace of mind! When choosing a travel insurance policy we require that you are covered for emergency medical expenses, medical evacuation, and repatriation. We also highly recommend you take out trip cancellation insurance, as this may cover cancellation penalties in certain circumstances if you have to cancel your trip unexpectedly due to illness, injury or other unforeseen circumstances. We like World Nomads, but ultimately you have to choose the company and policy that is right for you. If you’re 70 years old or older, you’ll have to use a different company. We’ll be asking for confirmation of your travel insurance 60 days before your departure. Please click here to get a quote. We love the services of these companies so much that we became affiliates, so we would ask that if you do choose to purchase these policies, you do it through our links. How do I get the local currency? The local currency in Ecuador in the U.S. dollar. Make sure you call your bank and credit card company to let them know you’ll be traveling in Ecuador, so they don’t put a hold on your card when they see it being used halfway across the world. Although there are ATMs on the Galapagos, we’d recommend getting money or changing money in Quito, just to be safe. What kind of hotels will we be staying in? All of our hotels are extremely comfortable and well-located for self-exploration. The hotels have wifi and hot water, but as you can imagine, the wifi can be rather limited and slow. Before the trip, we will make sure you have the hotel names and contact information to pass along to your loved ones. How can my family get ahold of me in an emergency? Before the trip begins we will give you the contact information for our hotels to pass along to your loved ones. If you choose to bring your cellphone or tablet, you can use VoIP services such as Skype, WhatsApp, and FaceTime to connect with your loved ones at home, as well. We will enjoy several snorkeling excursions in the Galapagos. We do recommend that you have tried snorkeling at least once before this trip (even if it’s just in a pool). While you should feel comfortable in your swimming ability, you can always wear a life vest during these excursions in the water. In fact, even strong swimmers sometimes like to wear a life vest just so they can have more fun floating and taking in the gorgeous underwater vistas around them. Although we won’t be in Quito long, it’s still an impressive 2,850 meters (9,350 feet). Some pre-existing medical conditions are known to worsen at high altitude, so it is imperative that you discuss your pre-existing medical condition/s with your physician. Certain medications are utilized to aid acclimatizing to high altitude; please discuss these options with your doctor or a local travel physician. PLEASE NOTE: If you know you are sensitive to altitude, we can arrange for you to arrive and depart from the sea-level city of Guayaquil, Ecuador, instead. We don’t have any itinerary items in Quito, and for many places, Guayaquil can be just as convenient a hub. Please let us know if this sounds like it may be a healthier option for you! Click here to read BJ’s take on how to prevent altitude sickness, as someone who has traveled extensively at high altitudes and never had ill effect and is an avid reader on the subject. Click here to read Lauren’s suggestions to natural therapies to begin before your trip. Lauren is a Board-certified Acupuncture Physician and Doctor of Oriental Medicine with a specialty in the world of dietary supplements. *All of the information here is for reference purposes only and is not intended to substitute for advice from a licensed health care professional. These statements have not been evaluated by the FDA and are not intended to diagnose, treat, cure or prevent any health condition or disease. If you are experiencing medical issues, you should contact your medical health care provider. Please use the form below or write [email protected] for more info! BJ & Lauren take great pride in the itineraries they plan, as they can personally vouch for every hotel, every restaurant, and every activity that you will experience. They craft each element of the trip with intention, and they understand that it is this careful attention to detail that sets them apart. Fueled by their passion, armed with know-how, and supported by knowledgeable local professionals in all of their destinations, BJ & Lauren set the scene for the vacation of a lifetime. The dynamic duo are available to answer any and all questions before the trip begins. 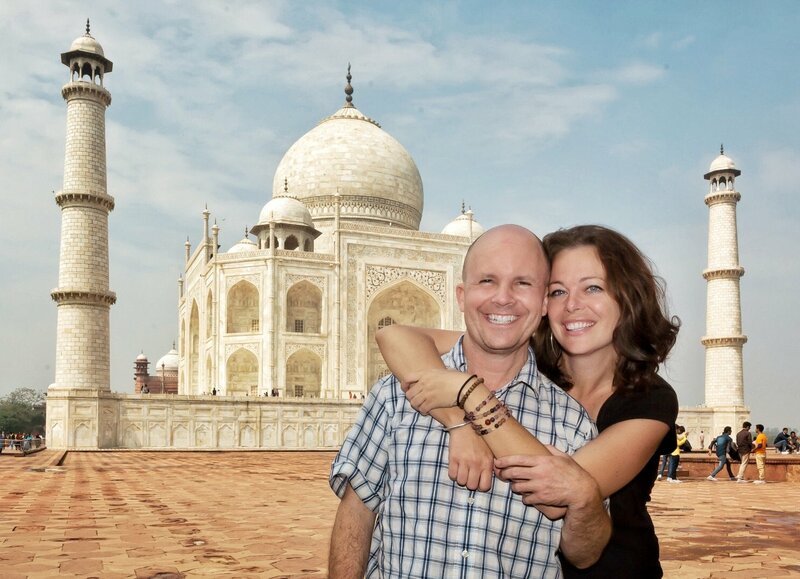 From giving advice on the best flights and travel insurance to providing a packing list, FAQ, and even a tiny “phrasebook,” BJ & Lauren pride themselves on these ‘nuts & bolts’ of personalized service. In addition, as a guest, you receive free travel consulting services (normally a $300 value) should you choose to extend your travels. As one of their most ‘frequent fliers’ put it recently, BJ & Lauren make everything easy for you. Once you arrive in your destination city, your trip is all-inclusive—your meals, transportation, lodging, site fees, donations, and tips are all taken care of. The research has been done, the itinerary carefully laid out, the reservations made, the t’s crossed and the i’s dotted. All you have to do is show up and take in all your destination has to show you! So….let’s get going! Please click a photo to see an enlarged version; you can use your arrow keys or mouse to navigate within the album.